The first negative supply forecast of the season spurred the operators of Britain’s oldest plants to offer their power at prices well above the prevailing market rates to fill the gap. The Aberthaw coal plant in South Wales offered the energy system operator a price of £240 per megawatt hour to turn on its two power units. Meanwhile, the Fiddlers Ferry plant warmed its coal-fired units in case its bid to produce power for a price of £995/MWh was accepted. 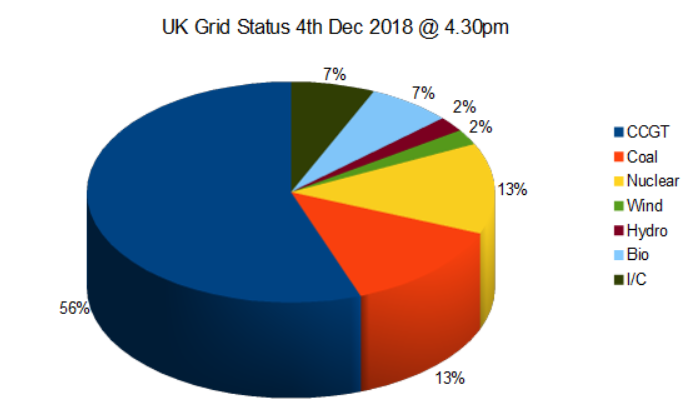 The market price for power during the peak demand hours of the day climbed to around £140/MWh as demand for electric heating climbed and wind power output fell to a fraction of its potential on a windy day. It’s behind a paywall, so I’m not allowed to show it all. However, it makes the point that the latest ECJ ruling to suspend capacity market payments could hamstring vital standby cover. It was not particularly cold or windless on Tuesday,when coal power peaked in early evening at 5.7 GW. Gas too was running effectively flat out at the time at 25 GW, along with the inter-connectors and biomass. We still nominally have 13 GW of coal fired capacity, but most of this is not viable without the capacity market payments, as plants are compelled to idle for most of the year. 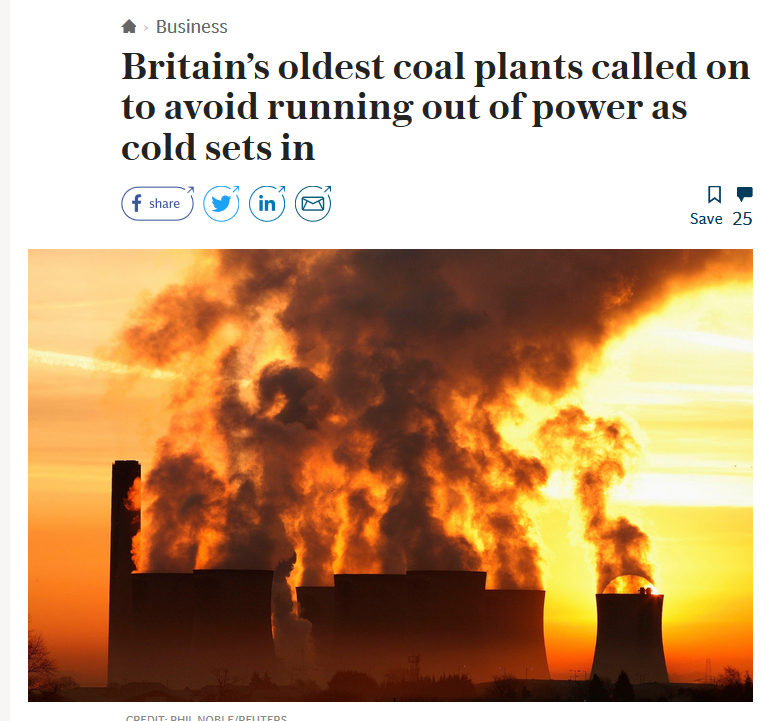 Which raises the question, how many coal plants will shutdown earlier than planned, and leave us short or power in future winters? Shock….horror…you mean….the “Experts” didn’t know what they were talking about? Daily Telegraph, Wednesday March 2, 2011. When does he leave the job, without a big payoff? He has failed miserably in his job which is to ensure a secure, affordable Electricity supply. Do that job or go! How can Mr Holliday ensure that the supply remains on when the government – Blue or Red Labour makes no difference – makes it impossible for him to achieve this? I think he was making an honest statement which if we had a functioning media should have resulted in uproar. What i dont understand is why the Brits sit there and out up with it. Build some nuke plants for crying out loud. Didnt Brutain own 1/4 if the planet once? Start sacking pollies and start getting stuff done. And get rid of Communuist May who clearly loves the EU…. Will the French end of the interconnector be usable after Brexit and the Yellow Vests have done their bit? All I can say is it’s a good job we have Greg Clark and Claire Perry in charge of keeping the light on when it gets really cold and the wind doesn’t blow.. I believe Claire Perry is over in Poland right now and has pledged £100M of taxpayers money to build renewable facilities in a far flung foreign country. The French will have to shut a lot of their old nuclear plants down soon as they are too old. They won’t have enough power for themselves so the interconnectors will be useless. If we are forced to leave with no deal and hence no transition period due to May’s appalling deal, then we will leave the Single Energy Market. Note that this not only means no electricity, but the gas will stop flowing as well which may well reduce the amount of generation possible using gas. Failing to keep gas storage open will be another government failure. One despairs! How did we let loose a bunch of ignorant, incompetent and indeed mentally deficient politicians at this problem? I think most of us knew that they would make a balls of it and that it would cost us dearly. Unfortunately they are still adherents to their false religion and if allowed will continue to wreck havoc. Er because everybody else voted for them. Look on the bright side, when the lekky stops so will the BBC. Unless the b.st.rds have generators. Most politicians have an oversized cranial cavity. How did we lose to the incompetent? We didn’t. They, and us, have lost to the Green Deep State that had taken over the BEIS since before Perry, Huhne, Davey, Milliband – and not forgetting Amber Rudd, who has failed in everything she’s ever done.. They were responsible for the green take-over. Were you taking about energy policy or Brexit? Were you talking about the UK or the whole of the EU, or even the UN? One really can’t imagine why “populist” (for which read “democratic”) movements have sprung up around Europe. Yes, you don’t need to focus on one area when talking about political incompetence. An important part of the Flexcit plan to exit the EU is that having taken back the power from Brussels we must put it to good use. To that it sets out how to bring power back to the voters and to make MPs accountable at all times by using right of recall. Early in the Winter to run out of power. Its normally cooler, with little wind,in January. I thought we had this STOR plan to get every back up generator, in the country, running at high demand times. From the coverage Christopher Booker did on STOR that would cost around 300 times to going rate per/Mwh so at least this was a cheaper option. Propping up the supply in an Australian state for just 2 days cost every user an additional $200 (£113). Most of the time. My Dad was giving an interview when a big belch of dirty smoke came out of the power station chimney. Meanwhile he’s busy explaining the clouds behind him from the cooling towers were harmless steam. He said to me ‘it’s a good job the tv people know so little that they had the cameras pointing the wrong way’. I drove past Ferrybridge power station earlier today – that was fired up but I suspect it may have been converted to guzzle carbon intensive but eco friendly wood pellets like Drax up the road. Green zombies in govt are not the only problem, the other major problem is excessive privatisation, i.e. keeping the lights on (and the gas flowing) now relies on sending the right “market signals” to private investors, and there is no way to keep prices from rising, because companies such as National Grid get their profits as a percentage of what they spend, hence a constant lobbying to spend more, especially on green vanity projects. but previous proposals from the IET, RAE, and Dieter Helm have fallen on the deaf green ears of the govt. Well that chart you posted a while back showing the increased death rate of pensioners didn’t cause much of a stir in the UK it seems. What happens when a bunch go dark on a deep winter day or week and there is a hockey stick on that chart? Is there any French in London? Macron reacts with troops ! The police unions are joining the protest which will mean all the backroom control staff won’t be there. Images of life giving, planet cooling water rising from cooling towers get my goat. The editors involved either haven’t a clue, or they are deliberately misinforming their readers by fake implication. We are seeing populism against Green here in France AT LAST things move. ? ?